We all know that a turquoise color with jewelry is often associated with summer. The fashion industry has come far and changed a lot over the years. We are at a point where we can combine and mix colors that generally wouldn’t belong to a particular season. Just like you can wear shorts with high boots in the winter you can wear turquoise in the winter as well! Turquoise is known as a fresh color, welcome color, and a color that moves us to serenity. Some believe that it helps you relax and rewind. So, are there any more reasons not to wear it all year long? We don’t think so! We believe that the turquoise color refreshes every outfit, especially in the darker and moodier seasons of winter and fall. Turquoise jewelry is perfect for everyday looks, especially if you go for a minimalistic look and you want to incorporate colors into it through accessories. Our recommendation for you would be our Infinity Necklace. It’s made of turquoise crystal beads, a burgundy cord and 24k gold plated coin and charms. You can wear it with neutral colors such as beige or gray and it perfectly goes with olive green and brown as well! Our Infinity necklace is very chic and it has a burgundy details which let you play around with your look a bit more. With your own style, you are telling a story about yourself. Manola girl is always courageous and independent minded! 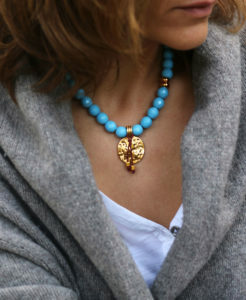 So, in order to complete your stand out look, you can match your necklace with a Breaking Away Turquoise. It’s also made of Czech beads, and decorated with heart charm. It has a burgundy cord too and matches perfectly with the Infinity necklace. If you want to take the turquoise experience to a whole new level, you should stack the Breaking Away bracelet with a few more of them. Our suggestion is to go with the Simple Truth Bracelet and the Dance Floor Deep Red Bracelet. 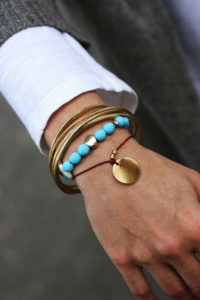 The simple truth bracelet is a set of five gold plated bracelets with 24k gold. Gold charms on a necklace go perfectly with the gold simple truth bracelets. Last, but not least is the Dance Floor Deep Red bracelet, which is a 24k gold plated coin charm. The burgundy fabric here accompanies the ends of the turquoise necklace and of the other bracelets. Now, this set represents your little unity of turquoise compositions that make you stand out, all the while burgundy and gold are complementing the whole look perfectly. So, are you ready to wear turquoise this winter?